Horizon Robotics, a leading AI chipmaker in China, inked an agreement with SK Telecom, South Korean's largest telecom operator, on promoting cooperation in the field of autonomous driving and will jointly develop Korean and global markets. 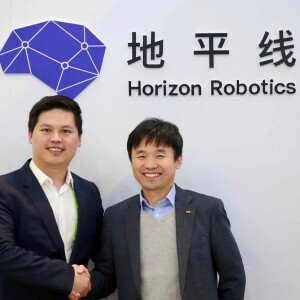 At CES 2019, Horizon Robotics (地平线机器人), a leading AI chipmaker in China, inked an agreement with SK Telecom, South Korean's largest telecom operator, on promoting cooperation in the field of autonomous driving and will jointly develop Korean and global markets, according to Horizon Robotics. The two companies will jointly demonstrate Level 4 autonomous driving solutions, HD updating solutions and ADAS (Advanced Driver Assistance System) devices. SK Telecom has been exploring 5G and autonomous driving technology in recent years. The company announced a new partnership with Hyundai Construction Equipment and geolocation software company Trimble to use 5G networks to monitor construction equipment. Electric Vehicle jointly developed by SK Telecom and Hyundai has been approved road testing license by the Korean government. It’s been the second time that SK Telecom and Horizon Robotics reached a cooperative agreement. Nov 2018, the two companies agreed on the smart retail development. September 2018, Horizon Robotics was invited to participate in IoT Korea Exhibition 2018 and displayed its Horizon Robotics Smart Retail Platform combines AI with IoT. China's offline retail market is worth around USD 4.5 trillion. Core competitive will always lie on how to solve big problems and removing inefficiencies (see more in this article). Everyone in the new retail era needs to be digital, in everyone, a PwC report pointed out, brands and retailers must now pursue a more balanced approach to digital transformation. Horizon Robotics unveiled Gauss-architecture-based processor Sunrise 1.0 and Journey 1.0 in 2017, in which Sunrise 1.0 chip is designed to leverage smart retail. Using Horizon Sunrise 1.0 processor, the power consumption is 1.5w, and it can detect 200 objects simultaneously, while Nvidia TX1 can detect 30 objects simultaneously with 20w power consumption. Horizon Robotics provides algorithms, hardware, software for retail enterprises. The company can digitalize offline consumer behaviors, analyze data leveraging face recognition technology, which enables retail managers to know exactly the arrival of customers and the popularity of goods and to establish collaborative linkages among “people”, “goods”, and “places”. By upgrading the shopping environment and shopping experience, retail enterprises can satisfy customers’ core demands accurately. For example, the company can improve retail sales by identifying passenger flow attributes, boost sales through motion trend analysis. Horizon Robotics' smart retail partners include Longfor Properties, China World Shopping Mall, Yonghui Superstores, Red Star Macalline, Belle, Kappa, Nike, SAIC Motor, Guangzhou Automobile, Shiseido, CITIC Bookstore and JIC Group, covering the business formats of shopping mall, brand store, home life, life supermarket, 4S shop, bookstore, etc.